Dr Frank proved that classic vinifera wine grapes could succeed in the cold of north east America. 'Finger Lakes Wine and the Legacy of Dr Konstantin Frank' by Tom Russ is primarily the biography of Dr Frank, and his family from before his birth to after his death in 1985. Carolyn Martin, who with husband Jean-Claude owns Creation Wines, an estate in the Hemel-en-Arde Valley south of Cape Town at Walker Bay recentlly held a tasting of their wines. Peter F May was there. Frosé is the surprise summer hit, says Peter F May. It's pink wine and fruit that's been frozen into slush. Cold, refreshing and good looking. What's not to like? Sour Grapes is fast paced movie about a multi-million dollar scam in rare old wines, and how a tenacious band of wine lovers turned sleuths to reveal the truth. Peter F May watched in amazement aa people paying the price of a luxury car for one wine bottle didn't even 'kick the tyres'. What is Orange Wine? Or –– Orange is the new White! The choice has been red or white or pink, but increasingly now there’s a new colour to add to your palate’s palette. Peter F May gets to grip with a white wine that wants to be red and ends up orange! Tastings are a great way to learn about wine, and they're Fun, says Peter F May. But there are some things you should not do at them, here are ten to avoid. Here are ten tips on how to get the best from wine tastings. Peter F May has attended more than he can count and also stood behind the table pouring at several. What does ‘fortified’ mean? Peter F May discusses the addition of brandy during winemaking. Whether it is 5 bottles or 50, you'll need to know what the cellar contains. Peter F May considers some options. Whether you have two or two hundred bottles available to drink in the future, yoou have a wine cellar, says Peter F May, who considers where and how to store them. What causes that smoky taste found in some wines? South African red wines are often noted as smoky by reviewers. The cause has been put down to local soils or winemaking practises. But the actual reason appears to be much simpler and, with hindsight, obvious. And it's avoidable. How did Mission Survive in America? How could the European grape variety Mission be planted and survive in the Americas when it's home to phylloxera? It was phylloxera on American vines taken to Europe in the late 1800s that destroyed Europe’s vineyards and then spread around the world. Walk around wine tastings need to be approached with a plan. Peter May attends two and meets someone with a rewardingly simple strategy. Do you save wines for special occasions and then find you've got wines which are aging past their best? Peter F May does and he says that it's time to drink up! Vin de Francois is a remarkable wine. It's a blend of wines from the best barrels chosen from several top wineries. Peter F May was lucky enough to get his hands on one. Wihy is Wine Being Made Everywhere? Wine is being made in unexpected places. Peter F May ponders why regions not traditionally associated with wine growing are now enthusiastically planting grape vines. Oak is the standard wood used for wine barrels, but winemakers are experimenting with alternatives, says Peter F May. Two wineries have discovered that by using certain woods they can avoid having to add sulphites to their wine. Summer is when thoughts turn to wines neither red nor white but in-between. From the palest ethereal pink through deeper hues to almost red, or orange these wines look beautiful in the glass. They’re served chilled, like a white wine but have a bit more body to them. Can Wine Taste of Minerals? Ever been at a tasting when someone recognises a flavour of the limestone or slate the grapes are planted on? Science says that's impossible, but Peter F May has an explanation. Montepulciano is a red grape grown in the Abruzzo region of Italy. Pt's Peter May's 'go to' wine for past and pizaa. With parsley behind his ear and an empty glass on his head Peter F May is taking the matter of matching wine with spicy foods seriously. Here are seven facts about wine, says Peter F May. Aging red wines on oak barrels is a sign of quality, says Peter F May, but a wine boasting of ‘well integrated oak’ or ‘oak treatment’ probably hasn't even seen a barrel. What's the Best Grapes for Fizz? Champagne has such a hold on winemakers around the world that they use the same grapes to make their fizz. Peter F May explains why those three varieties came to be so important and questions whether they should be. Visitors to a winery sometimes have the opportunity to purchase wines that are not available elsewhere. Peter F May took home 2008 Ridge Zinfandel Buchignani Ranch from Ridge Vineyards Lytton Springs winery in Sonoma County, California. Do You BYO - Bring Your Own Wine? Do you BYO? 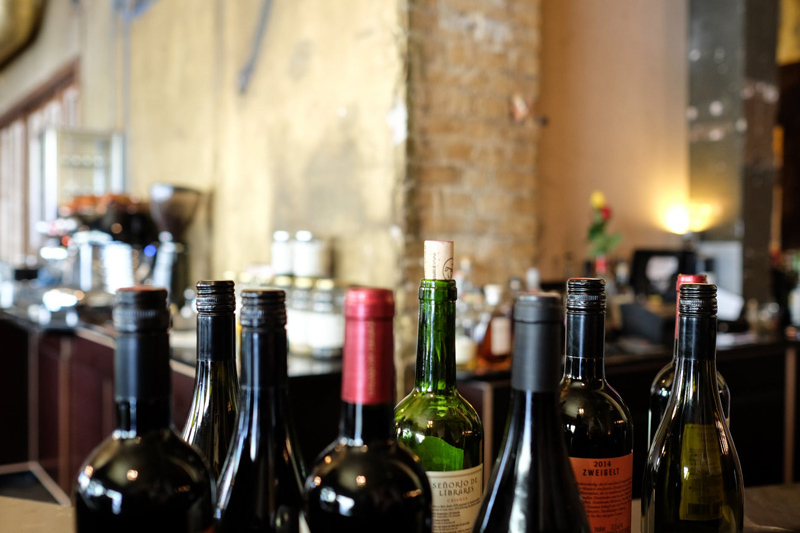 Have you asked a restaurant whether you can bring in your own wine? Peter F May often takes in his own wine when allowed. There are many maxims about wine. Peter F May considers three of them. Wither Hills Sauvignon Blanc comes from 13 different vineyards. Peter F May discovers the art of blending wines with a hands-on experience at the winery in Marlborough, New Zealand. Wine labels tell consumers about what is inside the bottle. Peter F May looks as how varietal labelling came to be all important. What is the ideal temperature to serve wine, selling wine label collections and why their is a warning that wine contains eggs, milk and fish are all questions Peter F May has recently answered. Barrels and grapes are about the only constants, says Peter F May. Machines are taking over in the winery and nothing is weirder than seeing a line of robot feet tramping towards you. Vineyards today are surprisingly high tech. Peter F May reveals that remote control drones are just the latest the latest technological tool. Ladybird/bug Beetle Taint in Burgundy? Burgundy expert Bill Nanson thinks that some recent vintages have been tainted by ladybird/bug beetles. Peter F May takes a master-class, listens to the arguments and tastes the evidence. Mateus Rosé is one of the world's most successful wine brand. On its iconic bottle is a picture of Mateus Palace. Peter F May visited the Palace in Portugal and found many riches but that bottle was not there. When hosting a dinner or wine tasting event, you´ll want to think about the order of the wine´s you´ll serve. Peter F May observes three simple rules. Lamb is the traditional meat served at Easter. But there is no agreement among wine lovers about what to drink with it. Peter F May looks at the choices and makes his own suggestion. Spice Route is a new winery attraction near Cape Town, and there is much more to see and taste than wines. Peter F May enjoyed tasting artisan chocolates and the breathtaking views. De Toren is a cult artisan wine estate near Stellenbosch, South Africa, that specialises in Bordeaux style blends. Peter F May tasted and took a vineyard and cellar tour. Delheim is a pioneering family owned winery in Stellenbosch, South Africa. For many years they have had a well deserved reputation for quality wines but sixty years ago they would have gone bust had not a complaint led to its most famous wine which saved the winery. A tangle of canes in a forgotten South African field turned out to be a long-lost historic rootstock vineyard. Peter F May visited Anton Nel who discovered its history and has plans for its future. Here's a wine guide for novices that won't go out of date. Peter F May reviews a book that helps novices find wines they'll like in supermarkets and then go on to find better quality wines with similar tastes. Famous and influential wine critic Robert Parker, the influential has blasted those who plant, grow and promote grape varieties that aren't already popular. Needless to say, Peter F May doesn't agree. How do you learn about wine? Taste as much as you can, says Peter F May, and a tasting group is the best way to sample a wide range. What does "vintage" mean and how important is it? Peter F May considers why vintage wine is considered superior. When Georges Duboeuf was 18 he made a bicycle ride that would change his life, improve the lives of his neighbours and elevate the wines they made to be world famous. Peter F May reviews a charming book that tells how Beaujolais became the most recognised wine name after Champagne. Fun wine quiz with an American Theme. No pressure, no prizes, just the glory, and maybe some factoids you can use to impress friends. Five wine related questions. No pressure, no prizes but can you answer them? Peter F May dons his question master's hat. When buying wine you may be told that this wine was barrel fermented and that wine was barrel aged. Peter F May explains the difference and tells how cheap wines can get similar effects and what are giveaway words on the label. Château Lafite-Rothschild is one of the world’s greatest wines. Peter F May was offered a bottle of the 1986 vintage with lunch, so why did he resist temptation? Do you know what to do when you're asked if you know the Bishop of Norwich? Peter F May explains all and has a solution to the problem of people hogging the wine decanter. Finding gifts for a wine lover is easy: there are many gadgets and an almost limitless choice of wines. But choosing a gift that the recipient will appreciate is a lot more difficult. Peter F May has some ideas. In 'The Vineyard at the End of the World: Maverick Winemakers and the Rebirth of Malbec' Ian Mount recounts 500 years of wine in Argentina, with emphasis on recent times and those responsible for changing a moribund industry and making an unfashionable grape variety a flagship for their country. Only the best wines will be served when world famous opera diva Dame Nellie Melba comes to sing at Downton Abbey. But Peter F May is not convinced by the wine’s labels. Scavi & Ray is a new Prosecco brand with big ideas. They're targeting fashionable young women with single serving bottles with straws. Peter F May supped with the fashionistas when he attended a Fashion Week launch party in an up-market designer bar. Old Vines make better wine, so they say but what is it that make old vines special? Peter F May asks a leading winemaker that very question. They’re the unappreciated wines ignored by most, they’re the varieties you’ve not heard of & those known only when grown elsewhere. Peter F May looks at the Chablis that isn’t Chardonnay, Burgundy’s other white grape, and California’s 5th most grown black wine grape that you’ve never ever heard of. Virginia is the happening place in American winemaking, says Peter F May. Whether you're going to visit Virginia or want to get up-to-date with this most exciting of American wine regions, Richard Leahy's 'Beyond Jefferson's Vines' is an essential read. .
Wine is delicious on its own, but sometimes it is great to make a longer drink by adding orange juice or to sweeten with liqueur or peach puree. Peter F May looks at some wine based cocktails that have become world famous. The launch of a cola flavoured red wine in France took the world by surprise, but Peter F May says that diluting and flavouring wine is nothing new. The glossary looks at that you that you might encounter at tastings and winery visits, including Lees, Killer Yeast, Malo MLF and Malolactic Fermentation, Meritage, Micro-oxygenation, and Natural Wine. Wine, like many interests and business, has a language of its own. This growing glossary explains terms in common usage at tastings and winery visits. Peter F May explains the meanings of drip irrigation, dry, dryland farmed, en primeur, enzymes, futures, green harvest, guyot and hybrid. If you are wondering what kinds of food to serve at a wine tasting, Peter F May has some ideas. A comic artist spends a year learning how to grow and make wine with a small artisanal wine farmer whose wines score 90+ Parker points. The result is this charming graphic book of naturalistic drawings, says Peter F May. Wine, like many interests and business, has a language of its own. The following entry in our expanding glossary explains terms in common usage at tastings and winery visits from Claret to Cold Stabilisation. Wine, like many interests and business, has a language of its own. The following entry in our expanding glossary explains terms in common usage at tastings and winery visits from Brut to Chateau. In 'Would Jesus Drink?' Joel McDurmon takes to task those who interpret the bible as forbidding alcohol. Using bible references he demolishes the arguments of the prohibitionists and shows God wants man to enjoy wine, beer and strong spirits in moderation. Wine, like many interests and business, has a language of its own. The following entry in our expanding glossary explains terms in common usage at tastings and winery visits from BIN to BRIX. If you have any requests for explanations to be added to the glossary, please ask. Wine, like many interests and businesses, has a language of its own. Peter F May explains terms in common usage that you may hear at tastings and winery visits. Russ Kane travelled throughout Texas visiting wineries and vineyards to write this most readable account. Peter F May found his tales of the people he met and the places he visited unputdownable. Glühwein is a favourite in winter, but as the 'wein' part of its name suggests, wine is its major ingredient. Peter F May shows how to make an version as close a possible to the real thing, without using any alcohol. Fifty Shades Freed brings a happy ending to the Trilogy. After looking at wines in the book, Peter F May considers wine choices throughout the Trilogy and suggests a menu for those wanting to host a Fifty Shades Dinner matching wines and foods most frequently enjoyed by Anastasia and Christian. Fifty Shades Darker by E L James is her sequel to her world-wide best selling Fifty Shades of Grey. Peter F May looks at the foods and wines consumed by the unconventional young lovers. Fifty Shades of Grey is a publishing sensation and wines mentioned in it are getting attention from fans who want to eat and drink as well as read. Peter F May looks at wines and food featured in the book and proposes candidates where the author has not named the exact wine. Jancis Robinson's long waited book on grape vines is out and it is huge covering 1400 grape varieties in 1300 pages. DNA evidence has revolutionised grape identification and this book has original research and the latest information. Peter F May has been enthralled with it. New Clairvaux Vineyards in Vina, California, is owned by the Abbey of New Clairvaux which is the first Cistercian Monastery in the Americas to grow, vinify and bottle its own wine. Peter F May visited and tasted their wines. When Peter F May went to taste wines at California's New Clairvaux Vineyards he had a surprise. Accidentally joining the wrong tour he was amazed to find an 800 year old monastery Chapter House. Carbonic Maceration is a winemaking process used to produce fruity light red wines with little tannin. Peter F May learns what it means and what happens during Carbonic Maceration that from winemaker Josh Rude in Oregon’s Willamette Valley. Cold Soak is a phrase you hear winemakers casually throw out but many wine lovers aren’t too clear about what it actually means. So Peter F May was keen to get the low down from Oregon winemaker Josh Rude. Where do you keep your corkscrew? Chances are that it is tucked away in a drawer in the kitchen. La Flute is a new corkscrew designed with aesthetics in mind and it is meant to be put on display when not in use. But Peter F May queries whether looks are more important than function. Faced with a shelf of wines a bright label and picture attracts attention. Peter F May looks at labels with animal pictures - the so called 'critter wines'. Wine labels are strictly regulated but sometimes wineries fall foul of authorities who ban labels for artistic reasons. Peter F May discusses banned labels. A collection of wine labels can be a reminder of past wines and times. But how do you get them off the bottle? Peter F May give some suggestions. Collecting wine labels can help you remember wines, meals and events you've enjoyed, says Peter F May. How would you choose wine if bottles didn't have labels? Surprisingly wine labels are fairly new. Peter F May looks at how they came about and why wineries started bottling their own wines and how we seem to be going back to old ways. How Much Wine Do I Need for a Wine Tasting? Determining the amount of wine you need for a wine tasting depends upon your wine, size of the group, and your intentions. Visiting a winery to taste its wines is an increasingly popular pastime, but what are the ground rules, will you be expected to know all about wine and do you have to spit? Peter F May has been in more tasting rooms than he cares to remember. Taking a winery tour is fun and a good learning experience but it can sometimes be confusing. Peter F May discusses what you’ll see and explains some of the buzz-words you might hear. Should you keep wines for years? Peter F May says that more wines are drunk too old than when they are too young. A New York grape pie started Peter F May pondering why we don't use this fruit more in cooking. Does Wine Really Contain Milk, Eggs and Fish? New allergy warnings are appearing on wine labels. Many drinkers will be astonished to read their wine contains milk, eggs or fish. But Peter F May says 'phooey'. Do ‘legs’ or ‘tears’ on the side of your wine glass indicate you are drinking an exceptional wine? Peter F May used to think so, but now he knows better. The American Wine Society was started 45 years ago. Peter F May looks at this non-profit wine enthusiasts organisation and reveals he will be speaking at its November annual conference. Do Sulphites in Wine Cause Headaches? Sulphur has been used in winemaking for thousands of years but it is only recently that it has been blamed for causing headaches. Peter F May considers whether it is guilty and ponders on why it is only now that it is getting a bad reputation. Sparkling wine is special, but there are several ways to get that fizz in your glass. Peter F May looks them and confesses to a discovery. There is excitement in the fine wine business after Chateau Latour announced it was pulling out of the long-established ‘En Primeur’ (or ‘futures’) system of selling wine, says Peter F May. They’re not exactly homonyms but they are wines and wine terms that sound alike and cause confusion, so if you want to know Pouilly Fumé from Pouilly Fuisse, Syrah from Petit Sirah and Variety from Varietal read on. The vehicle was travelling at 2km (1¼ miles) per hour and I was hanging on for dear life. Peter F May enjoyed the ride of a lifetime on a grape harvester. Broke the Grape's Joy is a heartwarming bitter-sweet novel of a middle-aged widow running an about-to-go broke St Emilion winery. Into her life comes an older man and a beautiful young girl. They will change her life but who can she trust? One of the most important vineyard jobs is pruning. Peter F May goes into the cold to wield his shears. How long does an opened wine remain drinkable? Peter F May has been experimenting. Terroir is one of those wine terms that you come across as you get interested in the subject But getting a clear explanation of what it really means has been difficult -- until now. Peter F May has the official definition. Golden unctious sweet wines, sweet brown Ports and Sherries, ice and noble rot wine, Peter F May loves them all. Australian Wine Walkabout is a charming readable account of Australian wine personalities and their wines, says Peter F May. Written by David Copp who has been in the wine business for fifty years, this is no text book but a conversational account based on Copp's visits downunder. All cork closures are not the same. Let Peter F May show you how to identify the type of cork in your wine bottle. If nothing else it’ll help pass that time in a restaurant after opening the wine and your food arriving. For years Peter F May has advised that cheap supermarket wines are not worth keeping. Then TV proved him wrong. California's Loma Prieta Winery is the largest producer of Pinotage wine. Peter F May has dinner with owner winemaker Paul Kemp. When Johan Reyneke took over responsibility for his family's vineyards he did something no-one in the country had ever done. Peter F May meets the first biodynamic farmer in South Africa. What makes a wine 'biodynamic'? Peter F May looks at a semi-mystical farming practise being adopted by wine growers. Finger Lakes' Heron Hill winery is going from strength to strength. Peter F May visited its spectacular tasting room and tasted its wine withe owners John and Jo Ingle. Death at the Chateau Bremont, by M. L. Longworth is a mystery set in the south of France, land of good food and wines. Peter F May investigates. You don't need to worry about storing wine at home. Peter F May answers your question on the subject. Camilla, Duchess of Cornwall, thinks an English sparkling wine should be called Champagne. Peter F May disagrees. Every year in April wine buyers and critics head to Bordeaux in France to taste and bid for wine that has not been made and will not be in bottle for another 18 – 24 months. Peter F May considers buying wine futures. Pink wines, also known by the French term rosé have become fashionable in the past few years, Peter F May looks at how they are made and remembers the origin of White Zinfandel. Can you tell Cheap Wine from Expensive? It is not common but wines at all price levels have been faked. Peter F May considers some recent cases. It is now fashionable to mix your wines at dinner parties. And why not? It's what winemakers do, says Peter F May. I have had an unusually large number of ‘corked’ wines in the past few weeks. But what does 'corked' mean? Peter F May explains. The best way to learn about wine is to experience as much as you can and to keep notes. Peter F May considers the ways and reviews The Wine Journal, a book in which to record your impressions of wines. The label may say Cabernet Sauvignon or Chardonnay but legally the bottle doesn’t have to contain 100% of that variety. Peter F May looks into why there’s often a secret ingredient. Neethlingshof Estate is a 320 year old wine farm situated in Stellenbosch, South Africa. Peter F May went for lunch and met the winemaker. A beautiful new colour book about Madeira wines confounds expectations by containing detailed information. Combine more competition among wine makers, abundant harvests, lower consumption, and you have an enophiles dream--quality wine at lower prices! The Wild Vine – A Forgotten Grape and the Untold Story of American Wine by Todd Kliman tells the story of Norton, America's forgotten grape. Also known as Cynthiana, Norton was once an important variety. Peter F May was enthralled. Master Sommelier Keith Goldston has a new online course 'Wine De-mystified: A Practical Guide'. Peter F May enrols to see if he can tell Claret from Bordeaux. There is a 40% discount on the cost of the course for readers of this article. What does Old Vines Mean? What does it mean when the label says 'old vine' asked a reader who'd bought a bottle of Zinfandel. Not much, says Peter F May. Corks are not all the same, says Peter F May, and they give clues to the quality of wine in the bottle. What is Tannin in Red Wine? Tannin is naturally produced in red wines as a result of fermentation and more is added during barrel aging. Peter F May considers tannins and why they are desirable. Mark Oldman’s exuberant ebullient new book -- Oldman's Brave New World of Wine –- aims to lead wine drinkers from their comfort zone and explore some less familiar wines that offer good value and great tasting experiences. Instead of sending empty wine bottles to the recycling plant make them into something else. There are many uses for old bottles; Peter F May suggests ten of them. An unusual gift for the winelover, Peter F May views Mick Rock's DVD of stunning photographs of French winelands and wineries. Can you imagine living in a country where you can’t buy a beer or get a glass of wine with your restaurant dinner? Peter F May reads Vivienne Sosnowski's fascinating tales of how California's grape growers and wineries survived during the fourteen terrible years of Prohibition. Chablis used to be the name for the house wine when Peter F May started drinking and that memory got him thinking about Chablis and Chardonnay. Tasting notes from Peter F May's recent visit to Breaux Vineyards, in Loudoun County, Virginia. Breaux Vineyards, in Loudoun County, was one of the wineries Peter F May visited in his recent tour of Virginia's wine country. Review of 'A History of Virginia Wines from Grapes to Glass' by Walker Elliott Rowe. Peter F May is enthralled by a detailed look at Virginia wine today and yesterday. Peter F May visited Virginia's wine lands and was captivated. New York's Finger Lakes wine region sees Riesling as the white grape with which it will have the greatest success. Peter F May visited the region and tasted them. Why are we fixated on single varietal wines, ponders Peter F May and he samples Apothic Red, a new California blend. What are ICE, ICED and ICEWINES? What is the difference between an 'ice' wine and an 'ice wine', apart that the second will cost more than 100% more? Peter F May explains about some of the rarest and most expensive wines you can buy -- and their modern imitations. Here is the easy simple effort free way to open wine closed with screwcaps -- with step by step pictures. What is a Case of Wine? Will there be a nasty surprise waiting for you at your destination, asks Peter F May. Many countries like to tax travellers who carry alcohol. Flying with wine raises more considerations that just safely packing bottles says Peter F May. New York is a major wine producer and, although its wines are hard to find outside the state, that is about to change as America’s east coast has the confidence to take on the world, says Peter F May. Travelling by air and want to bring home wine with you? Peter F May has some suggestions for these times when you can't carry bottles in you carry on baggage. With current air security arrangements we cannot carry liquids in our hand baggage yet fear bottles packed in our baggage may break or leak and wine will flood our bag. Is The Wine Diaper the solution? Peter F May investigates. Yellow Tail's new wine used social media to choose its name and for marketing. But what's in it for us? Wine Fairs are great learning experiences but to get the best out of them consider the three 'P's, says Peter F May. Temperature and wine have an intimate relationship. The most misunderstood wine ‘fact’ is that red wine must be served at room temperature but temperature affects the final taste of wine long before it is poured. Peter F May investigates. Wineries sometimes produce different batches of wine under the same label. If you read a review of a wine that impresses you enough to go out and buy it and you are disappointed when you taste the wine it may be because you have tasted a different wine. Peter F May explains why this happens. Want a wine qualification with an impressive certificate to hang on your wall, yet don’t fancy book studying or taking examinations? All you need to qualify for certification by the Wine Century Club is to drink some wine. Barrels - Why are they used? Wooden barrels were once the standard goods container. Nowadays you'll only likely to see them in a winery. Peter F May asked today's winemakers why they still used this archaic reminder of the past. Old Wine - How much is that bottle worth? How much is an bottle of old wine worth? Peter F May explains what factors affect an old bottle's worth. How do you find the value of an old wine? Peter F May gives some tips. Sabrage is the name given to the art of slicing open Champagne with a sabre. In this article Peter F May explains how anyone can do sabrage and that a sword is not needed. The hows and whys of decanting wine at home or in a restaurant. Glühwein is a warm spicy traditional German winter drink made from warmed wine. It's easy to make and very welcome if you've been out in the cold, maybe carol singing! Glass wine bottles are on their way out. Glass wine bottles are so last century! The wine business wants to move to alternative packaging because its better for the planet and saves them money. And it seems the public are increasingly willing to pour wine from tins, plastic and cardboard. Peter F May investigates. A recurring story going the rounds holds that blood products are found in wine, worrying for mad-cow disease reasons and distasteful for vegetarians. Peter F May looks at the facts. Having read in Sunday’s newspaper that the restaurant at Rust en Vrede winery had been judged third best in Africa and first for service at the same time as winning a wine tourism award we decided to head there for lunch and to see for ourselves. Peter F May had never heard of Waking Up Chardonnay until winemaker tells him that it is one of those ancient practises that modern wineries are rediscovering and adopting. An old book alerts Peter F May to a caring French tradition and then he speaks to modern winemakers and finds it seems the French were not alone. Wine should be enjoyable. So why do so many of us find restaurant service an ordeal? Peter F May dispels the nonsense and empowers you to deal with snotty sommeliers. So you've tasted the wine and there's something funny. Do you send it back? Peter F May discusses this tricky issue. George Taber's third wine book is a tour through twelve of the worlds most exciting wine regions, but Peter F May thinks he may have lost his way. Does the way the wine bottle is closed affect your purchasing habits? No closure is ideal, all have strengths and weaknesses. Peter F May lists them here. This week we look at matching wines with Chicken -- Roasted, Fried or in a creamy sauce. What is the dimple in wine bottles for? At some time, when talking about wine, the question of why there is a depression in the bottom of a wine bottle will be asked and there will someone who is certain they knows the answer – but do they? This week Wine and Food Matching looks a two ways of tenderising tough cuts beef. By grinding it and by cooking in wine. Wines to match Hamburgers and Beef Bourgignon are on the menu. How do you determine the alcohol content of wine, and what is the label telling you?? The Champagne Cocktail is THE classic mixed drink. Elegant, impressive and showy -- but it is really easy to make and needs no skill or bartenders tools. Matching wine and food can be a worry for many people but there’s no need to fret. In this introduction to the subject, Peter F May cuts through the mystique with some commonsense suggestions. Vintage Wine - What Does it Mean? Why is the term ‘a vintage wine’ used to mean a particularly good bottle when nearly all wines on store shelves bear a vintage year on the bottle. Peter F May thinks he knows. The historic Adonis cocktail is made from sherry and vermouth, and is lower in alcohol than most. Trying to stop bubbles forming in wines made in Champagne eventually led to the worlds most famous sparkling wine. Do you know how wine is made? This non-technical article describes the journey from grape vines to the liquid in your glass, and why one grape species is favoured.